Helping people to build a place they can call home. Hello to all! This week we will be onsite working on Courtney's future home! What: This week is roof week! Sheathing and shingles and hurricane ties, oh my! We will be hosting our final Women Build team, Team Cohen, Kinne, Valicenti, Cook this Saturday. Space on site for non-Women Build volunteers will be limited on Saturday, though we will be serving a full day on Friday. Please contact Katiana or Aliza with any and all questions. Currently, we have openings for groups of 5-15 volunteers to join us on the jobsite from August through December. We work from 8am to 3pm on Fridays and Saturdays. Your group will help us to stay on track with the completion of Courtney's future home! As part of your day of service, CBHFH asks that groups provide lunch as an in-kind donation for themselves and the 7-10 Core Volunteers and Habitat staff who will be supporting their team. Volunteer groups take part in all aspects of home building, from framing walls to installing insulation to roofing or landscaping. We are open to all skill levels! We schedule on a first come first serve basis so please be in contact as soon as possible to secure your preferred date. To schedule your group’s day on site, please contact our Volunteer Coordinator Katiana Selens (kselens@berkshirehabitat.org, 413-442-3181). 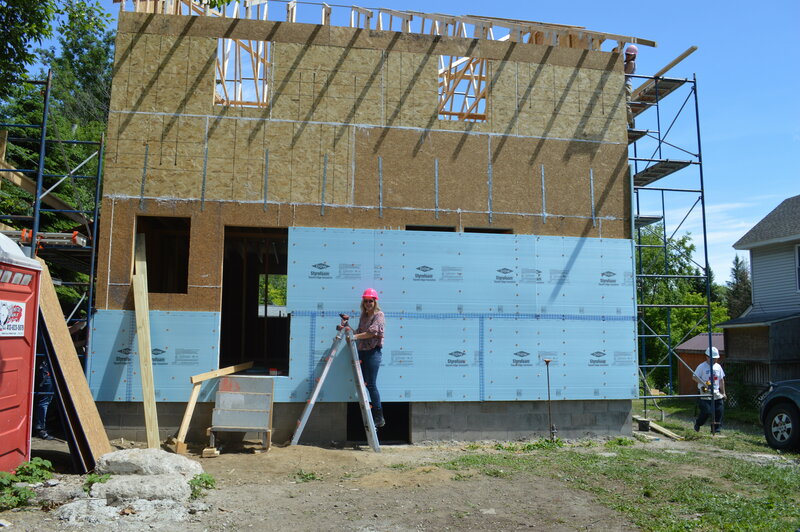 "Last week, our knowledgeable and tenacious core volunteers were joined by a Women Build team of men working in solidarity with the true Women Builders from Greylock Federal Credit Union. The guys did a great job on wall sheathing, blue foam and basement windows and we’d love to have them back. The past two Saturdays we were also blessed with teams of volunteers from Sacred Heart and First United Methodist Churches of Pittsfield. Not only did these teams continue with insulation, they also moved scaffolding, laid plywood on the roof deck, made preparations for the heating system and supplied very tasty lunches. I'd also like to thank Steve Dadak for lending us scaffolding during this stage in our build. We are so grateful for the time, effort, and attention our community has put towards this project". "A completely new segment on site was the addition of "New and Good" where everyone shares something new and exciting in their life. The great thing about this practice was obvious; an introduction to each person. The efficiency in such a prompt was that no task need be assigned and tried for staff and AmeriCorps to 'feel out' where the volunteer naturally felt inclined! It worked beautifully! Some volunteers wanted to "learn something new" some volunteers were just "happy to be out of the office/outside" and a couple made it known that they were "ready to do anything asked". This is fantastic information to have upfront before any work is actually done". "Brass doorknobs disinfect themselves. The ions in the metal have a toxic effect on spores, fungi, viruses, and other germs, eliminating the infections within eight hours". Please Consider a charitable gift or donation of materials or services. We thank you for your support as we build a better Berkshire.